My life thus far has been one encompassed by a love for all forms of art. From music to painting to sculpture, most significant members of my family are heavily involved in some type of artistic expression. I too have always been involved in many different kinds of art, however little of what I did seemed like it had any substantial effect on people. Obviously most art invokes emotion of some sort, however it seemed to me that a very small portion of it would truly change peoples lives. Therefore, I began pondering ways in which my art could change people’s lives for the better. The obvious solution to this became immediately apparent: body art. To permanently alter a person’s appearance, whether it be a little or a lot, and at the same time have this alteration improve that persons self-confidence, and set them apart from the status quo. Body piercing was something that had intrigued me ever since I was a child, and so I began researching it further. As I learned more about it’s history, practices, and procedures, I decided that it was my place in the world to become a part of this ancient and beautiful practice. I began piercing in 1995, after extensive research into the subject, and landed a job piercing at a local studio. It was not long after I started piercing that I realized I needed a more in depth education pertaining to all aspects of the industry. I began networking with other piercers, healthcare professionals, even a local reconstructive and cosmetic surgeon (who shall remain nameless, but to whom I owe a huge debt of gratitude) in order to expand my knowledge of cross contamination, sterilization procedures, anatomy, and much more. I worked in a couple of what I now perceive as mediocre studios until September of 1999 when I was hired at Evolution, Inc., and I feel that my all around abilities as a piercer have expanded exponentially since then. Working for Evolution has not only expanded my knowledge in relation to the piercing industry as a whole, but it has also expanded my knowledge of my own spirituality, and how the practice of piercing can alter and enhance my clients spirituality as well. As a piercer I do not only give people piercings, but I like to think that I also open their eyes to a new sensation, angle of perception, and concept of themselves. My profession as a body piercer is one that I am very proud of and have the utmost respect for. This is not a typical job, and certainly cannot be viewed as such. People of all types and all backgrounds trust me with their bodies every single day and that is a huge responsibility that should always be respected, and never underestimated. I have had a passion for modification for as long as I can remember. Growing up the only girl with younger brothers didn’t leave much room for me to be outside the box (so to speak). I was told no when I asked to have my navel pierced when I was 16, and again at 17, the answer was always “when you are 18, out of the house, and paying your own bills”. In rebellion of my parents I began to stick larger rings into my earlobe piercings, this simple act of stretching my piercings made me feel for the first time ever like I was myself. After graduation and turning 18 my dreams of modifying myself became a reality. Despite my conservative family I saved up my own money, did my research, and got my very first tattoo. Even though it was small it was symbolic to me in so many ways. From that day on I began to modify my body into an image that made me feel strong, beautiful, and more than anything else it made me feel like myself. Every time I added a new piercing I would feel empowered and beautiful, and each one added to my growing love of all things body piercing. in the nation became a reality. Working with such an amazing group of people has not only deepened my respect for this industry but lead me to a very powerful understanding of what it means to alter your body. For some a piercing is nothing more than a piece of metal, but for others it is a deep grounding of positive self image, and that beautiful moment is what makes me strive to make each and every experience at Evolution truly amazing. After starting as Counter Intelligence, working in the position of Assistant Manager, and now being given the incredible opportunity to become an Apprentice Piercer I am ecstatic to be able to continue my education and be able to pass on my love for this industry to each and every client I work with. I am thankful each and every day for what Evolution has taught me. I have learned and grown up with this crew and I couldn’t have asked for a better group of talented and hard working peers. I was born and raised in Albuquerque NM, and from a young age I had an interest in body modification. When I was ten my older brother got his ears pierced and I just had to have them too. My parents made me wait until I was thirteen to get them pierced, but when I did I knew I was hooked. I loved having my ears pierced; it made me feel more complete in a way that I didn’t understand at the time. I later stretched those piercings and started adding more to the collection. The way self expression through my body modifications made me feel ignited a passion for the industry. By the age of sixteen I knew what I wanted to do with my life: I wanted to share this gift with others and help them experience the same feelings of fulfillment that my piercings gave me. At the age of seventeen I started to frequent local piercing and tattoo studios around Albuquerque. I had a goal, to learn how to pierce, and nothing was going to stop me from that. By the age of twenty I had gotten an apprenticeship at a local studio and ever since then I have strived to be the best piercer that I can be. I have always had this drive to learn about all things body modification, and this ambition lead me on a quest for more information about the safest and highest quality piercings and jewelry out there. After 4 years as a piercer I had a new goal: to educate myself and learn how to pierce in a way that was not only safe, but a quality overall experience. I wanted to be able to provide nothing but the best to my clients. Over the next 4 years of networking and connecting with piercers all over the country, I knew I needed to be in a studio that held the same values of quality and safety as I did. This led me to Evolution. I am ecstatic to be able to continue my education and dedication to this industry in a studio that holds such high standards. I look forward to building on my career with this amazing studio and all of the people that have created this environment. I was born in Everett, WA in 1991, moving to Taos, NM when I was 10 years old. I was raised in a very conservative religious household, where self-expression through the means of altering your physical appearance from body modification to dying your hair was considered a taboo, making it all the more enticing to me from as early as I can remember. In 1997, I was out with my father, walking down the sidewalk in the city. From the opposite direction, there was a man heading towards us that was covered in piercings and other modifications. I stopped dead in my tracks in amazement when I saw him; I didn’t know what piercings were, but I loved how they looked. At that moment, all I knew was that I wanted to look like him. This experience left a lasting impression on me that would set the course for the rest of my life. Over the next ten years, my interest in piercing did not fade, and I eventually realized that not only did I love piercings, but that I also wanted to do them for other people who felt just like I did. Later on, when I was 16 years old and living in Taos, I walked into my first professional tattoo and piercing studio. When I walked through the doors, I felt an instant sense “arrival.” I looked through their portfolios and saw clients come and go as they were getting pierced and tattooed. I then asked for a job at the counter, which I was promptly denied. This did not deter me, and I continued to hang around the studio over the next few years, eventually securing a job there when I was 19. While I had been pierced earlier on at retail stores that used inappropriate equipment such as piercing guns, my first experience with being pierced in a professional body modification studio was when I got my septum pierced at 18. For me, this experience was nothing short of a total “rebirth” for me. I felt like through this experience, my true self was finally allowed to emerge after many years of suppression. From that point, I was pierced several times until I became the front counter/receptionist for the studio. After a couple of moves and false starts, I finally found the opportunity to become a body-piercing apprentice when I returned to Taos in 2012. Once I finished my apprenticeship, I finally realized my dream and became a professional body piercer. Over the years, I have worked at studios in Taos, Santa Fe, and now Albuquerque, as I recently joined the team here at Evolution Body Piercing. My love of body modification has only grown over the years, driving me to want to learn as much as I can while developing my skills as a body piercer. Outside of being a piercer, I am happily married to my wife Amber, who I met through the studio I became a piercer at. We love to paint, do arts and crafts and cook together. We both practice a vegan lifestyle and consider ourselves advocates for animals. Over the years, I have also played in various metal bands and still love to play guitar when time allows for it. 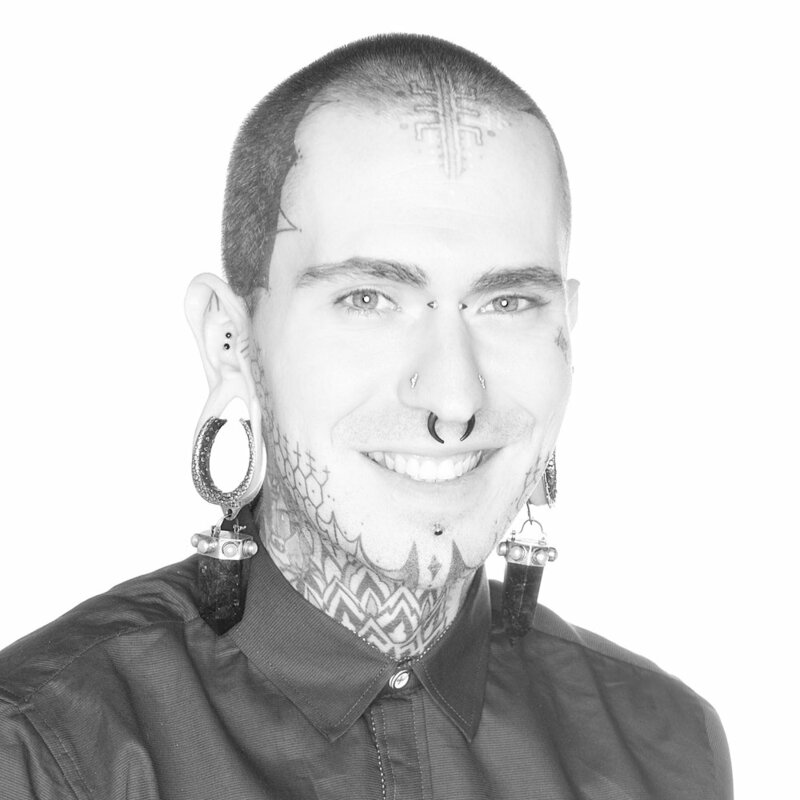 Working at Evolution had provided me with the team and environment that I have always dreamed of since I set my heart on being a piercer many years ago, and I intend to make the absolute best of this new and exciting opportunity. I look forward to working with the clients who walk through the doors at Evolution and hope to facilitate positive change through body piercing. I was born in Plano, TX in 1984 and moved to Albuquerque by age 7, where I have lived ever since. My first initial contact with body modification came through my mom and my older sister. When I was a kid, they each had several Helix piercings going up and down both of their ears, and I loved the way they looked and how my family chose to express themselves through their piercings. At age 13, I received a worker’s permit and took a job as a bagger at a grocery store. The grocery store had a strict dress code, which was something I really struggled with as I sought to openly express myself. Soon after, I got my very first piercing, which was an eyebrow. This experience made me feel like myself in a way that I never had before, and I was instantly in love with it. When I returned to work, they wanted me to remove my fresh eyebrow piercing, or else I would be fired. I was not about to give up this new modification that I loved, so I ended up quitting. The amazing way my first piercing made me feel in contrast to working at the grocery store made me realize that I wanted a career that accepted or encouraged self-expression, so I continued to get more piercings and started hanging around local piercing studios and meeting the people who worked there. Over the years, I accumulated 35+ body piercings along with several other tattoos and modifications all while I spent more time with other body art professionals. I always loved the variety of reasons and meanings that piercings and modifications had for the many different types of people I met. So as my personal passion for piercing continued to develop, I knew that I wanted to be more than a client. 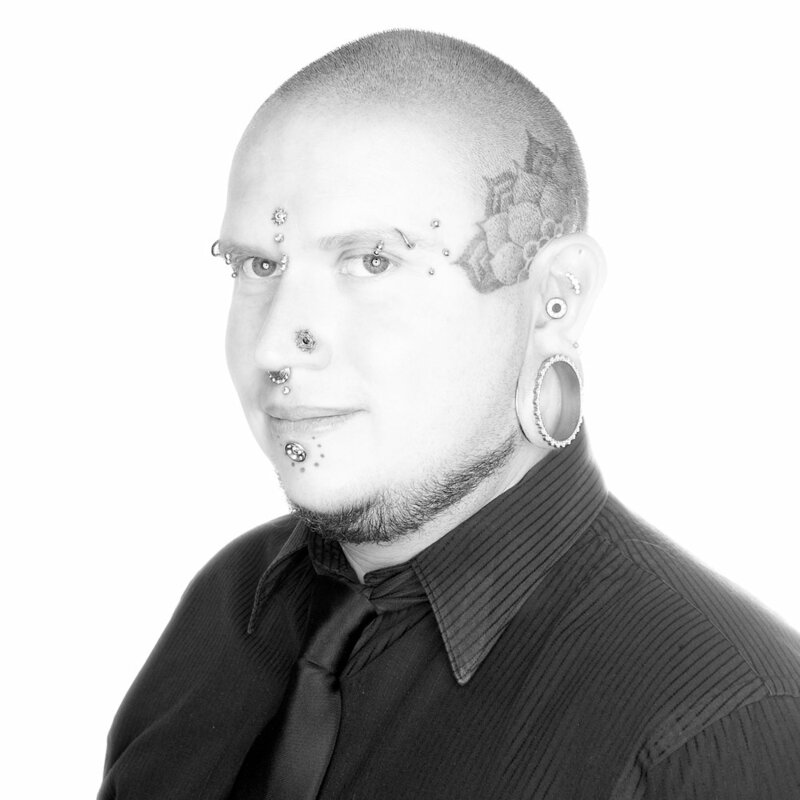 I desired to be on the other side of the table, helping others achieve their special, unique goals through body piercing. My first break into the industry came through my longtime friend (and now fellow Evolution Piercer) Scott Self. I began an apprenticeship under Scott at a local piercing studio, and one year later became a licensed professional piercer. Since then, I have worked at various locations in Albuquerque over the last seven-plus years, finally landing my dream job at Evolution Body Piercing in early 2018. My goal has always been to learn as much as I can while working around the best, most professional individuals in our industry, which is one of the many things that Evolution has provided for me. When I’m not at work, I enjoy spending time with Lucille, my Red Tail Hawk that I have trained to go hunting with me. I enjoy bow-hunting, health and fitness as well, and have helped friends with their personal fitness goals and meal planning. At Evolution, my desire is to continue growing in both knowledge and skill while doing what I love most in life, and I hope that through piercing, I can give people the special and personal experience I had 20+ years ago.